Drivers education should be something you enjoy doing with your teen. Learning to drive a car with your parent is the best kind of drivers ed. No parent wants their teen to wreck the car. That is why we created this powerful set of tools to help you give them the best driver education available. 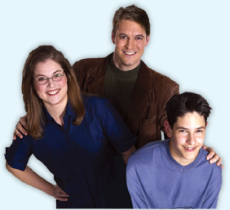 Driver Ed in a BoxÃÂÃÂÃÂÃÂÃÂÃÂÃÂÃÂÃÂÃÂÃÂÃÂÃÂÃÂÃÂÃÂ® is a complete parent taught driver education course for new drivers. 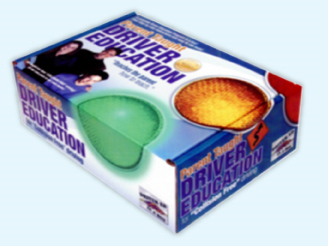 Designed by nationally recognized driver training expert Patrick L. Barrett, Driver Ed in a Box provides parents with all the tools necessary to help their teens become safe, collision-free drivers. Driver Ed in a Box is a driver-training curriculum thatÃÂÃÂÃÂÃÂÃÂÃÂÃÂÃÂ¢ÃÂÃÂÃÂÃÂÃÂÃÂÃÂÃÂÃÂÃÂÃÂÃÂÃÂÃÂÃÂÃÂs designed so you can teach your teen to driveÃÂÃÂÃÂÃÂÃÂÃÂÃÂÃÂ¢ÃÂÃÂÃÂÃÂÃÂÃÂÃÂÃÂÃÂÃÂÃÂÃÂÃÂÃÂÃÂÃÂ¦on your schedule. The aim is to give you a simple training program that you can easily implement with your young adult. Driver Ed In A BoxÃÂÃÂÃÂÃÂÃÂÃÂÃÂÃÂÃÂÃÂÃÂÃÂÃÂÃÂÃÂÃÂ® is for the parent/teen who wants a program that focuses on giving the instructor and student more tools for the Behind the Wheel phases. ItÃÂÃÂÃÂÃÂÃÂÃÂÃÂÃÂ¢ÃÂÃÂÃÂÃÂÃÂÃÂÃÂÃÂÃÂÃÂÃÂÃÂÃÂÃÂÃÂÃÂs for the parents that truly want to help their son or daughter become a safe collision-free driver. 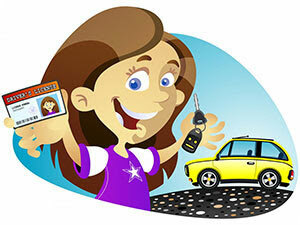 ItÃÂÃÂÃÂÃÂÃÂÃÂÃÂÃÂ¢ÃÂÃÂÃÂÃÂÃÂÃÂÃÂÃÂÃÂÃÂÃÂÃÂÃÂÃÂÃÂÃÂs for the teen that wants to score higher on the permit test and feel safer, more confident behind the wheel. You are able to complete the course at your own pace, on your schedule. You donÃÂÃÂÃÂÃÂÃÂÃÂÃÂÃÂ¢ÃÂÃÂÃÂÃÂÃÂÃÂÃÂÃÂÃÂÃÂÃÂÃÂÃÂÃÂÃÂÃÂt have to wait until the end of football season, or the start of summer vacation, to begin the training. With Driver Ed in a BoxÃÂÃÂÃÂÃÂÃÂÃÂÃÂÃÂÃÂÃÂÃÂÃÂÃÂÃÂÃÂÃÂ® you’re allowed to MASTER each skill set before you move on to the next. As your new driver will gain confidence in their skills and will not be intimidated by more traffic and possible dangers. Your teen will master the skills and know the dangers before they enter each new area of driving. You want your teen to get their license, but more importantly, you also want to be a safe, collision-free driver. At the end of this course, your teen will be a safe driver, and also have the confidence to drive in all kinds of traffic, any day of the week, any time of the day. 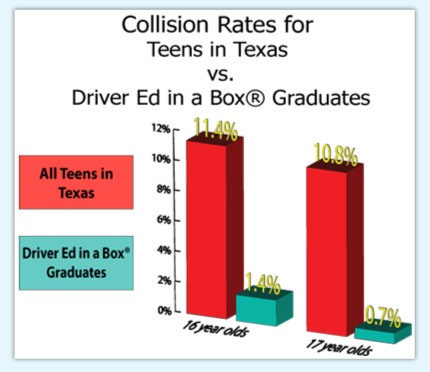 A review of the driving records of the graduates of the parent-taught driver education course, Driver Ed in a BoxÃÂÃÂÃÂÃÂÃÂÃÂÃÂÃÂÃÂÃÂÃÂÃÂÃÂÃÂÃÂÃÂ®, shows that while 16 year old drivers in the State of Texas have a collision rate of 11.4%, 16 year old drivers using Driver Ed in a BoxÃÂÃÂÃÂÃÂÃÂÃÂÃÂÃÂÃÂÃÂÃÂÃÂÃÂÃÂÃÂÃÂ® have a collision rate of only 1.7%. What is a “collision rate”? It is the number of collisions reported to the Department of Public Safety as reflected on the individual driver records divided by the number of licensed drivers in that category (then multiplied by 100 to convert to a percentage). 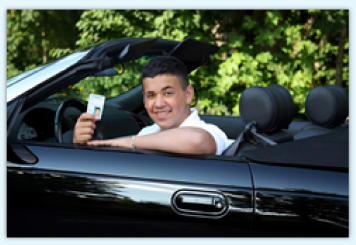 In April of 2005 a random sample of 1,009 of Driver Ed in a BoxÃÂÃÂÃÂÃÂÃÂÃÂÃÂÃÂÃÂÃÂÃÂÃÂÃÂÃÂÃÂÃÂ® 16 year old graduates’ driving records were pulled directly from the Department of Public Safety’s records. The Driver Ed in a BoxÃÂÃÂÃÂÃÂÃÂÃÂÃÂÃÂÃÂÃÂÃÂÃÂÃÂÃÂÃÂÃÂ® 16 year old graduates had only 14 collisions for a collision rate of 1.7%. ÃÂÃÂÃÂÃÂÃÂÃÂÃÂÃÂ¢ÃÂÃÂÃÂÃÂÃÂÃÂÃÂÃÂÃÂÃÂÃÂÃÂÃÂÃÂÃÂÃÂMy dad and I listened to the CD’s and watched several of the beginning videos, and my dad explained the terminology used before starting in the parking lot. This system of driver Commenting was probably the most helpful part of the program, both because it made me conscious of whether or not I was doing the right things and it told my Dad exactly what I was thinking so that he would know if I was aware of the hazards or if he needed to alert me. We began driving in the parking lot, progressing next to light residential streets and then to streets with faster speeds and heavier traffic. Freeway driving was my final step in urban driving. Everything you need to teach your teen to drive collision-free is in the box! The Driver Ed in a BoxÃÂÃÂÃÂÃÂÃÂÃÂÃÂÃÂÃÂÃÂÃÂÃÂÃÂÃÂÃÂÃÂ® program is now available online. Now you can access everything you need from any computer. Just login and get started. The Driver Ed in a BoxÃÂÃÂÃÂÃÂÃÂÃÂÃÂÃÂÃÂÃÂÃÂÃÂÃÂÃÂÃÂÃÂ® program is still the best and most thorough, and now that itÃÂÃÂÃÂÃÂÃÂÃÂÃÂÃÂ¢ÃÂÃÂÃÂÃÂÃÂÃÂÃÂÃÂÃÂÃÂÃÂÃÂÃÂÃÂÃÂÃÂs online, itÃÂÃÂÃÂÃÂÃÂÃÂÃÂÃÂ¢ÃÂÃÂÃÂÃÂÃÂÃÂÃÂÃÂÃÂÃÂÃÂÃÂÃÂÃÂÃÂÃÂs even easier to use. I loved getting to know how to drive. Also, learning how to maneuver and cooperate with others on the road. The most helpful parts of this program were the videos. Driver Ed in a BoxÃÂÃÂÃÂÃÂÃÂÃÂÃÂÃÂÃÂÃÂÃÂÃÂÃÂÃÂÃÂÃÂ® includes 17 videos. 15 of the 17 Videos were independently produced by Driver Ed in a BoxÃÂÃÂÃÂÃÂÃÂÃÂÃÂÃÂÃÂÃÂÃÂÃÂÃÂÃÂÃÂÃÂ® and are from the perspective of parent and student working together in the vehicle. Driver Ed in a BoxÃÂÃÂÃÂÃÂÃÂÃÂÃÂÃÂÃÂÃÂÃÂÃÂÃÂÃÂÃÂÃÂ® features a 42 part audio series for Parents to prepare for each stage of in-vehicle training. 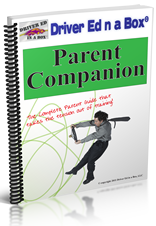 Parents can listen while traveling to and from work, running errands, or working around the house. ÃÂÃÂÃÂÃÂÃÂÃÂÃÂÃÂ¢ÃÂÃÂÃÂÃÂÃÂÃÂÃÂÃÂÃÂÃÂÃÂÃÂÃÂÃÂÃÂÃÂThe in-vehicle training part of the program, of course, was the most helpful to me. Listen to each section just preceding work on the next area of in-vehicle training, so the information is fresh in your mind as you begin that training phase. 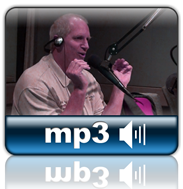 Some parents select certain segments of the audio series for the student to listen to before or after beginning a training area. Parents have told us that it often helps for the student to hear the reasons for training methods from another source than the parent. – or your money back! 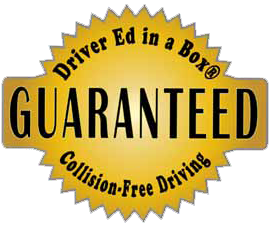 We guarantee that once you successfully complete all the requirements of the Driver Ed in a BoxÃÂÃÂÃÂÃÂÃÂÃÂÃÂÃÂÃÂÃÂÃÂÃÂÃÂÃÂÃÂÃÂ® course and has been issued a Certificate of Completion you will drive collision free for a full 12 months**. If you have a driver-error collision within one year from the date of completion resulting in a claim being filed and a deductible being paid, we will refund the full amount paid for the program. Driver Ed in a BoxÃÂÃÂÃÂÃÂÃÂÃÂÃÂÃÂÃÂÃÂÃÂÃÂÃÂÃÂÃÂÃÂ® course! ÃÂÃÂÃÂÃÂÃÂÃÂÃÂÃÂ¢ÃÂÃÂÃÂÃÂÃÂÃÂÃÂÃÂÃÂÃÂÃÂÃÂÃÂÃÂÃÂÃÂDriver Ed in a BoxÃÂÃÂÃÂÃÂÃÂÃÂÃÂÃÂÃÂÃÂÃÂÃÂÃÂÃÂÃÂÃÂ® has given me a head start in driving. I knew more in my first week of driving than my friends learned in a year. Right away I was taught how to deal with distractions in and outside the car and still be totally focused on driving. In the areas where I live, many teenagers get seriously injured or die from accidents involving too many distractions in and around the car.